Ancient Italy, as we can see from now, was really a mixture of numerous nations of completely different origin. Fertile lands, mild climate and rich mineral resource deposits made people seek their new homeland here, on the peninsula between the Tyrrhenian and the Adriatic. Aboriginal European population and several waves of migrants turned the national map of Italy in the 1st millennium BC quite many-coloured and mixed, and even now we cannot state for sure "who was who" there, when in 753, or even earlier, Rome was founded. The history and geography of ancient Italy is known rather well, as both Greek and later Roman authors did their best to describe every little historical event, every tribe and every town here. But - what a paradox - still too many mysteries remain undiscovered. The whole people, Etruscans, who were neighbours of Rome, and who are mentioned a thousands times in Roman chronicles, disappeared with their language completely lost, and their origin unknown. So did many small tribes of Italy, whose language, preserved in several inscriptions or even words, was unknown to Romans and can hardly be cracked nowadays. The very history of Rome, the capital of all Mediterranean, obviously keeps a lot of secrets. While in the Middle Ages and during the Renaissance period people used to believe everything written by Roman historians and chroniclers, later results of archaeological, cultural and linguistic research showed everything must have gone another way. How was the city founded, and who were its first inhabitants? What language did the first Romans and their neighbour tribes speak? What was the role of Etruscans in Roman history and culture? We shall try to answer all that here. § 1. Traditional History of Rome. The history of Rome ab urbe condita (from the foundation of the city) was a favourite plot already for Roman historians in the period of the Empire, when Rome became one of the greatest cities of the world. For example, one of the most famous authors of the early Roman Empire was Titus Livius, with his 142 volumes of "Historia" (17 AD), which were not quite a research work, but a tale which Livius preferred to mix historical facts, ancient legends, copies of Greek myths and his own bright additions. Certainly, such history could only be partly considered true, as Livius fully depended on his predecessors, borrowing the whole volumes from their books without even checking fantastic stories. Among other great works we can find "Roman Archaeology" by Dionisius of Halicarnassus (7 BC). Being a Greek, Dionisius wrote his huge manuscript in order to show the common origin of Greeks and Romans, to reconcile Roman invaders and Greek patriots in Greece. That is why most attention was paid to mythological plots of Greek origin of the Latins. Besides, Dionisius was a rhetor by profession, and therefore his first task was to make his work readable and interesting, not strictly historical. The third famous book is "Historical Library" by Diodorus of Sicily (29 AD), which is in fact a complete compilation of more ancient Greek authors and some oldest Roman annalists. But that was not bad, as the works written by those annalists were lost and are now known only in Diodorus's description. As for Livius and Dionisius, they even did not took the trouble to study ancient sources. But still the ancient historiographs help us now to learn more about the birth of Rome. The facts they describe, and differences between their versions make the full picture much more exact. According to the traditional canvas, the first city of Latium (the region where Rome was later founded) was Alba Longa. This small town, which really existed even in the Empire age, was founded by Ascanius, the son of Aeneus, one of the heroes of the Troy War. Aeneus settled in Italy after Troy was destroyed, and his son unified Latins and founded their capital. Then, as it was fashionable in ancient times, names of following Latin kings are given in all ancient works, but none of them (13 at all) did anything special, so the very history begins with Numitor and Amulius, two brothers, who struggled for the throne of Alba Longa. Amulius appeared a winner, killed Numitor's sons, and isolated his brother's only daughter Rhea Silvia in a temple. But she was not so simple to forgive this, so she once gave birth to twins whom she called Romulus and Remus. That was the last she could do, Amulius beheaded her, and ordered to put her children into a basket and to throw it in the Tiber. But Amulius was the only one who thought the story was over. Waters of the river returned the babies back to the ground, where they were found by a she-wolf who nursed them. Later a cattleman Faustulus and his wife found the basket, and since then the history of Alba Longa and the whole Latium turned another way. Babies became two young princes, learned about their royal origin, went back to Alba Longa, killed Amulius, returned Numitor back into power, and then went to a distant hill near the Tiber and founded a city called... Here the two brothers argued a bit about the name of the future city, but all arguments ended when Romulus wittily killed Remus, became the only king, and the city was called Roma. The date of this event, pointed first by Varro, another Roman historian, was the year 753 BC. Other variants include 751, 754 and some other dates. This is how the legends reversed history. But in fact they were composed just in order to prove the origin of Romans from Greek or Trojan, to explain the history of Rome as the part of the Greek history, and to justify somehow why Rome appeared the greatest of Italic cities. But unfortunately life is not so beautiful and picturous as legends and myths, though every fairy tale always contains a grain of the truth. This very grain we shall try to find. Following the research made by archaeologists in this and the previous centuries, Italic tribes came to Latium, where later Rome emerged, in the late second millennium BC (about 1100 BC). That was already the second wave of Indo-European migrants from the northern Balkans, and together with them, as we can believe, Venetic and Illyrian tribes appeared in Italy. Some scientists are sure that Italy was occupied by Indo-Europeans from the Balkans via the Adriatic sea, which explains the strange picture of Indo-European settlements in ancient Italy, which were situated mainly on the southern and western shores of the peninsula. If they came from Central Europe, they should have passed through Northern Italy, where in fact Indo-European traces appear only in the 7th century BC. Northern regions of the peninsula were occupied by numerous aboriginal nations, whose destiny, language and origin are still quite unclear. Among them, Ligurians and Rhaetians are believed to have been the relics of the pre-Indo-European population of Europe. Other mysterious tribes lived southward from the Alps - Picenes, whose inscriptions are not translated yet, Umbrians, who were originally non-Indo-European but later gave their name to Italic newcomers from the Balkans, and Etruscans, the most famous nation of pre-Roman Italy. Etruscans came to the peninsula in about the 10th or the 9th century BC, and whether they arrived from Asia Minor or from Central Europe, is a secret. Their rich culture was original and unique among other European civilizations; their language was unknown to neighbouring peoples, and their script, though deciphered, cannot be read: even Romans, who acquired a lot from Etruscan culture and state system, lost the key to their language very early. The whole nation disappeared quickly leaving so much to us, but we cannot still say what their origin and their language was like, though that was Etruscans who influenced greatly the whole Roman history and who played a vital role in the very birth of Rome. In the 9th century BC Latium, the homeland of future Romans, situated in Central Italy, on the shores of the Tyrrhenian Sea and on the left side of the Tiber River, was known by its fertile lands and mild climate, allowing its population to grow very fast. Numerous hills along the rivers and near the lakes made the region quite suitable for founding towns, as well as the density of population and its cultural and religious ties, which also helped organizing an urban way of life. Latium at that time was a mixture of different nations and small tribes, among which the most powerful nation was Latin. Actually, Latins was not a single nation, but a sort of a confederation uniting plenty of tribes of common Italic origin. They spoke the same language, led the same way of economic life and worshipped the same deities. The ancient center of Latin settlements was situated in Alban Mountains in central Latium. Due to Italic traditions, and also to later Etruscan influence, Latin towns and villages composed the urban alliance, which was both military and (even more) religious. History keeps memory about such a federation led by the city of Alba Longa, where all Latins used to gather to the sacred temple on a mountain and to the common meeting. The official leader of the alliance was the king of Alba Longa, who also played a part of the supreme priest during the festivities. Latium was situated on a very profitable spot - just in the center of the peninsula, which made its towns rather rich in trade and cooperation with neighbours and all Italic nations. But this also created a dangerous surrounding of a lot of hostile tribes which lived in the vicinity of Latium. Mountainous Italic tribes - Volscians, Hernicans, Rutullans, Auruncans, Aeques and Sabines - were mainly representatives of another subgroup of Italic people - the Osco-Umbrian branch. The majority of them were less civilized, did not have any contacts with Greek and Etruscan civilization, were cut off from the sea trading and quite warlike; they were fond of coming down from their mountains and pillage Latin towns - this made Latins unite in a federation. In the 8th century, on the eve of Rome, Latium was suffering the Sabine influence: Sabine tribes gradually occupied valley of the left side of the Tiber and contacted a lot with Latin towns. Still, these ties were mostly peaceful, as Latins and Sabines have common gods, common traditions, and their language with much in common as well. This meant the the Sabine element was, as fate willed, to play an important part in the initial Roman history. The other powerful neighbour of Latins was the Etruscan civilization. Since the 9th century Etruscan cities and trade contacts were dynamically developing, along with the Etruscan expansion in Italy. They occupy the valley of the Padus river in Northern Italy, and start gradual movement of settlers to the south, to rich Campania, with its famous Greek colonies Cumae and Neapolis. Between Etruria and Campania lied Latium. In fact the nearest Etruscan towns were quite close to Latium - they were built on the right side of the Tiber (like Veii and Cere), and their colonies existed even on Latin territory (e.g. Fidenae). That is why Etruscans could not ignore any important event in the life of Latium. We do not know for sure when exactly Rome was founded. It seems, however, that the date 753 is just a legendary figure which did not mean anything special in real history. Archaeological research shows that the first settlement within the territory of modern Rome was founded on the hill of Palatinum near the Tiber around the 10th century BC already. The ancient tradition of history agrees that Palatinum was the first to be inhabited. The hill was rather convenient for a town - it was situated near the Via Salaria - "Salt Way", which went from the deposits of salt in the mouth of the Tiber to the country. This salt and its output later became the most important item of Roman trade with neighbours. Palatinum and places around it contain many burial places where burials were completed by burning of the dead. That is why it was strange and surprising to find completely another type of burials on the nearby hills of Aesquilinum, Viminal and Quirinal. These burials, when dead people were laid unburned, start appearing in the 9th century and continue in the 8th one. Though it is obvious, that the culture of both communities was similar a lot, they must have been different tribes: Latins and Sabines. It is widely known that Latins everywhere used to burn the dead, while Sabines and other tribes of the Osco-Umbrian branch, on the contrary, never did such. By the way, the traditional legend never contradicted with these facts. 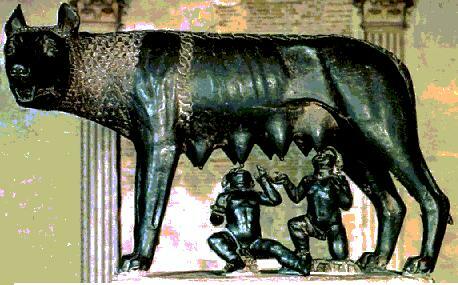 Manuscripts say that the community founded by Romulus and his fellow Latins in 753, unified with the Sabine one quite soon. At first Roman guys demanded some women to make the population of the city grow; they invited Sabine girls to a festivity, then stole all them and took home, making them their wives. Sabines were furious and declared Romans war, but the women had quite enough time to fall in love with their new husbands, so they forced both belligerent parties to stop the war. After that the king of Sabines, Titus Tacius, became a co-ruler with Romulus over the city. This proves the theory saying that two settlements founded on the hills over the Tiber in the end united and formed a city. The valley between the hills was later called the Forum. But we doubt there was any exact event that made two villages unite; more probably it was a long process towards the unification, and gradually people occupied the slopes of the hills and merged. The term "city of the seven hills" which appeared in Roman historiography meant the later stage of the city growth: after two hills united, other villages, either Sabine or Latin, situated on all other nearby hills, coincided to a single city. The last hill which was added to the new city was the famous Capitolium, a steep height next to the river which was too small to place a village, but enough to construct a fortress and several temples, common for all citizens. That is how the seven hills made Rome, as it is shown on the map above. Another understanding of this ancient term is that the seven hills were just two heights on Palatinum (Palatinum and Cermalum), three heights of Aesquilinum (Cispius, Fagutal and Oppium), the hill Celium, and the place between them, named Velia. Now about the Etruscan trace in the early history of Rome. First of all we should ignore the legend of Romulus himself: Roma is an Etruscan name. The names of the three main triba (tribes) which formed the first population of Rome, were Luceri, Ticii, and Ramni. These, as many think nowadays, were the names of the three tribes which composed the citizenship. While Luceri could be Latins (they worshipped a wolf, lupus, which was their main totem), Ticii must have been Sabines (from their legendary king Titus), and Ramni, who gave the name to the whole city, is not an Italic name - more likely an Etruscan one. Though Etruscans did not inhabit any of the hills of early Rome, but in the 8th century their merchant caravans and migration waves were directed from Etruria southwards to Campania via Latium, so they are believed to have settled in Rome when it was already built. Even in the epoch of the Roman Empire there was a district in Rome called "Etruscan", though at that time no Etruscans lived there. But in the early period the Etruscan population could make about a third of Rome. According to ancient legends, the second king of Rome was Numa Pompilius, a Sabine from the city of Cures. The next one, Tullus Hostilius, was a Latin: we should mention that kings then were elected by the people, so they did not succeed their ancestors. The fourth king, Ancus Martius, again a Sabine, according to the tradition, added the hill of Janiculum (across the Tiber, on the Etruscan territory) to the city's borders. All this period Etruscan migrants settled in Rome, and so when in 616 BC a newcomer from Etruria, some Lucius Tarquinius, "ran for kingdom", he was elected king, and this was the beginning of the Etruscan rule in Rome. Here historians often argue: some say that Etruscans simply captured Rome and established their dynasty there. But nowhere in legends we could find a single word confirming that, and Lucius Tarquinius was respected in Rome even in the period of the Republic, as he did much for the city's prospering and defense. We can state, so, that the Etruscan rule was accepted in Rome due to the strong influence of Etruscan culture there and due to the Etruscan part of its population at that time. Etruscans ruled over the city for the next century: Servius Tullius and Tarquinius Superbus were the last kings of Rome. As for Tullius, sources differ - some call him a Latin from a poor family, but in the 1st century AD Roman Emperor Claudius in one of his speeches in front of the Senate called him an Etruscan named Mastarna. This version was later proved by an inscription on one of burial plates found in Etruria. In the 6th century the Etruscan dominance began to irritate Italic Latins and Sabines, who were tired of the Etruscan language and culture. A conflict between the Latin nobles and the king led to an uprising, and Etruscans were ousted from the city in about 510 BC. After that, Rome already could be called a really Latin city.